How to mail a birthday cake. The Boy turns 21 next week and we won’t be there to help celebrate – what to do? One of us (I can’t remember who to blame) said, “We should mail him his birthday cake!”. 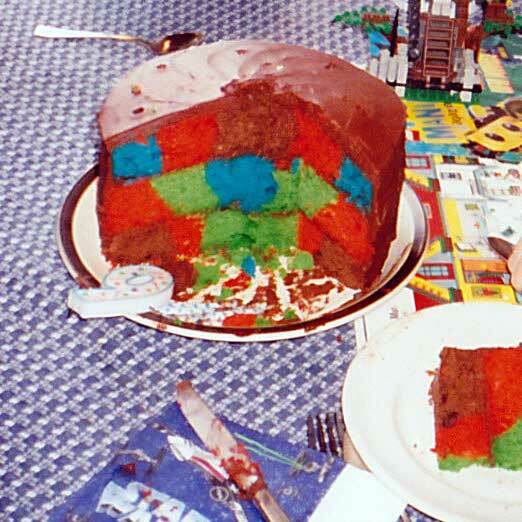 This isn’t just any old cake – in our family you get a checkerboard cake with your choice of any three colors or dealer’s (mother’s) choice if you can’t make up your mind. We did really UPS the cake to Providence this afternoon, so I dug out a 15 year-old photo from birthday #6 to show the finished effect. This year’s version is YELLOW/red/blue and yes, I did mean to put that in all caps. Wow, the yellow. I’ve adapted the recipe from the back of the Chicago Metallic Cake Pan Set because really, Einstein himself couldn’t divide this batter into thirds precisely enough to make the original work out to three even layers. The original proportions are in parenthesis if you feel up to the challenge. Preheat oven to 340 (325) degrees and grease and flour the three 9″ pans. The instructions imply that the pans are nonstick but um, no. I use cooking spray, and I also spray the divider. Mix 5 (4) C flour, 4 (3) tsp baking powder, 1 tsp salt in a bowl and set aside. In a small pan or the microwave melt 1 1/4 C butter which is 2.5 sticks (1 C or 2 sticks) and cool. In a VERY large bowl, cream the butter with 2 1/2 (2) C sugar. Add 5 (4) eggs, one at at time, beating after each addition. Add 1 Tbs vanilla. 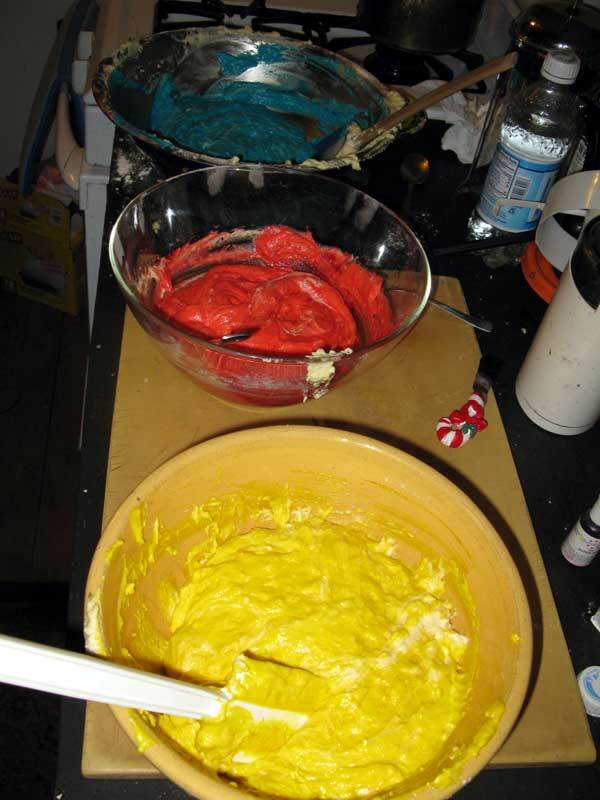 Divide the batter in thirds and add food coloring. If you want to make one ring chocolate you might add 3 oz of melted semi-sweet chocolate to one bowl. Work fast, because the batter sets up fairly quickly and doesn’t “flow” as nicely after a while in a warm kitchen. Put the divider in the pan and press down to snap in place. Fill each ring about half-way up with each color, alternating the color choices in each pan. There are very good directions on the box for this step although they say to wash and dry the divider between pans and yikes, that’s a lot of work. I lift it carefully and vertically out of the batter and go on to the next pan because I’m a bad person but really, the cake will be fine. The box emphatically tells you DO NOT PUT DIVIDER IN THE OVEN, so don’t do that. The directions say to bake for 25 minutes but with the slightly thicker layers I check at 30 minutes. If you can, rotate the pans halfway through to keep the layers even. 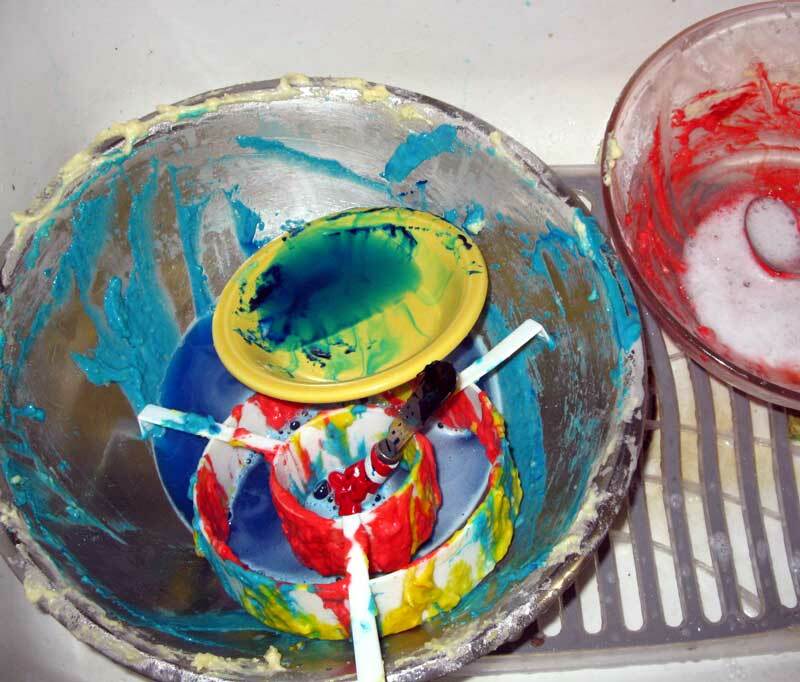 Remove when cake springs back to the touch or a tester comes out clean. The colors will probably darken on the surface but they will still be hallucination-bright when you cut a slice. Cool on racks for about 10 minutes, remove from pans. Happy crazy clean-up! I use a chocolate ganache frosting spread very thinly between the layers to allow the checkerboard to really show off, and then much spread it much thicker on the top and sides to hide the colors until the cake is cut. We’ll have to wait for The Boy to send pics to see that. I put the unfrosted layers on cardboard cake discs, sealed each one in a gallon Ziplock bag and stacked them in a 12″ x 12″ x 8″ box with a box of birthday candles and assorted decorations, 2 sealed and bagged plastic containers of frosting, a card, and a lot of air-pillow-packing. The nice ladies at the UPS Store slapped fragile stickers all over it (thanks Victoria!) and sent it off with loving care. Happy Birthday, Boy! This entry was posted in dessert, family, recipe, science! and tagged cake, dessert, family, recipe, spring on May 16, 2012 by APo. oh man, this is terrific! I bet you are verrrrrrry good at this by now! I laughed and laughed. 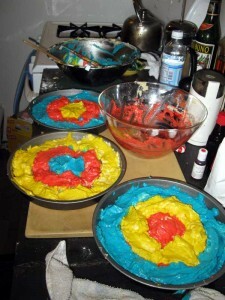 And then imagined the party he will have with his friends assembling the cake for birthday TWENTY ONE!! even better.